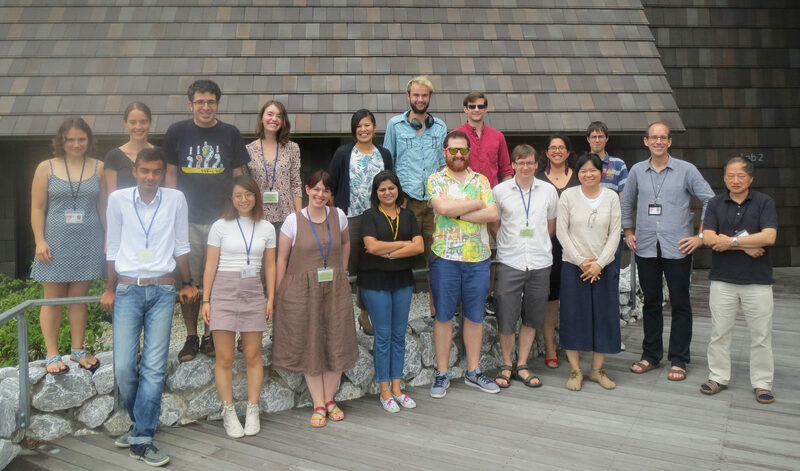 In the past year we have focused on vortex dynamics in Bose-Einstein condensates, quantum engineering of ultracold atom systems through shortcuts to adiabaticity, the description of quantum thermodynamics properties in strongly correlated quantum systems, spin-orbit coupled BECs and several other topics. Radiative coupling between two atoms has been a topic of great interest for the past several decades and the range and strength of the coupling can be enhanced by means of suitable environments. 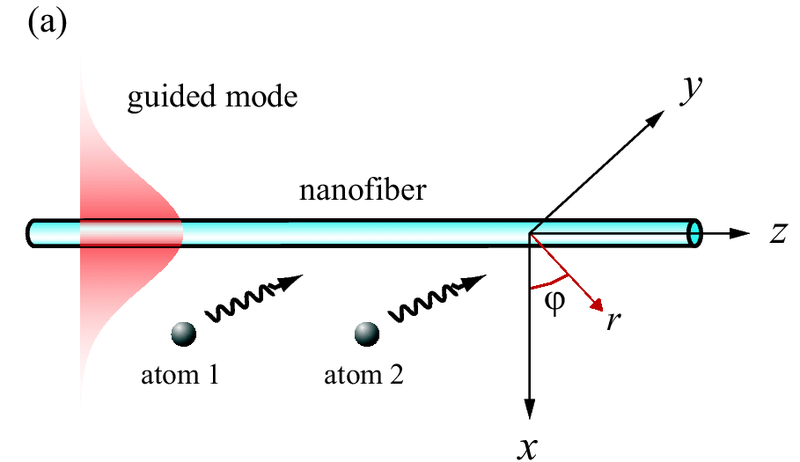 In this project we have studied the radiative coupling between two two-level atoms with arbitrarily polarized dipoles in the vicinity of a nanofiber. We have focused on the case where the atomic dipoles are circularly polarized and, consequently, the rate of emission is depending on the propagation direction, that is, the radiative interaction between the atoms is chiral. In order to get insight into this chiral coupling, we have looked at the decay behavior of the atoms as well as the fluxes and numbers of photons emitted into guided modes and obtained expressions for the single-atom and cross-atom decay coefficients and their directional components. The chiral radiative coupling was found to modify the collective emission of the atoms and the modifications strongly depend on the initial state of the atomic system, the radiative transfer direction, the distance between the atoms, and the distance from the atoms to the fiber surface. Quantum technologies based on adiabatic techniques can be highly effective, but often at the cost of being very slow. 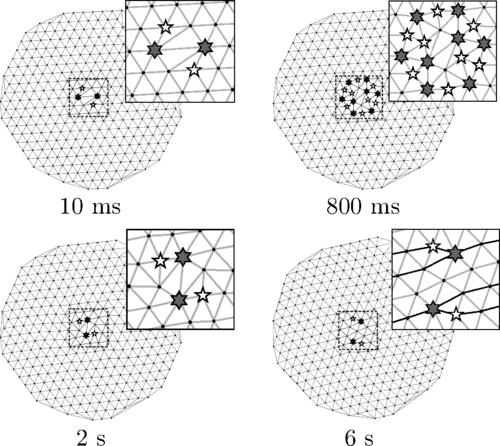 In this work we have introduced a set of experimentally realistic, non-adiabatic protocols for spatial state preparation, which yield the same fidelity as their adiabatic counterparts, but on fast timescales. In particular, we have considered a charged particle in a system of three tunnel-coupled quantum wells, where the presence of a magnetic field can induce a geometric phase during the tunnelling processes. We showed that this leads to the appearance of complex tunnelling amplitudes and allows for the implementation of spatial non-adiabatic passage. We have demonstrate the ability of such a system to transport a particle between two different wells and to generate a delocalised superposition between the three traps with high fidelity in short times. Vortex lattices in rapidly rotating Bose-Einstein condensates are systems of topological excitations that arrange themselves into periodic patterns. 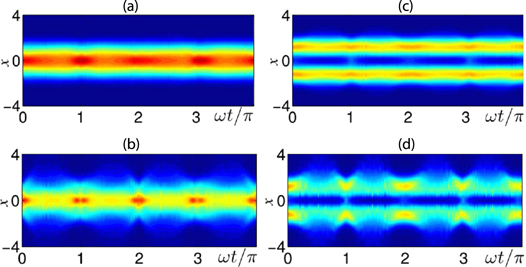 In this project we have shown how phase-imprinting techniques can be used to create a controllable number of defects in these lattices and examined the resulting dynamics. Even though ultracold atomic condensates are usually described using the mean-field Gross-Pitaevskii theory, the full range of many-particle effects among the vortices can be studied in this way. In particular we have shown the existence of localized vacancies that are quasistable over long periods of time and characterized the effects on the background lattice through the use of the orientational correlation function and Delaunay triangulation. Figure: Delaunay triangulation of the vortex lattice after removing one vortex through phase imprinting, shown at t=0.01, 0.8, 2, 6s. The resulting lattice defects are indicated by white and gray stars for fivefold and sevenfold defects, respectively. One can see that two (5, 7) dislocations are formed quickly, which settle and persist in the lattice for long times. Lattice dislocation lines are indicated for inset t=6s. We have appled the framework of non-equilibrium quantum thermodynamics to the physics of quenched small-sized bosonic quantum gases in a one-dimensional harmonic trap. We have shown that dynamical orthogonality can occur in these few-body systems with strong interactions after a quench and we have found its occurrence analytically for an infinitely repulsive pair of atoms. This phenomena is related to the fundamental excitations that dictate the dynamics from the spectral function and we were able to establish a clear qualitative link between the amount of (irreversible) work performed on the system and the establishment of entanglement. Extending our analysis to multipartite systems by examining the case of three trapped atoms, we were able to show that the initial (pre-quench) interactions play a vital role in determining the dynamical features, while the qualitative features of the two particle case appear to remain valid. Finally, we have proposed the use of the atomic density profile as a readily accessible indicator of the non-equilibrium properties of the systems in question. Figure: Evolution of the density profile for an X atom (panels (a) and (b)) and an impurity Y (panels (c) and (d)) resulting from the implementation of a sudden quench in the interaction between the X atoms, while the interaction between the X and the Y atoms is always large. Here we consider gX quenched to g = 2 and g = 20 (top and bottom row of plots, respectively).